What would you do? Have you been to the point where there is no more patience, no more money, no energy and it seems no hope? You are thirsty in every way possible. And then, you discover this small gift, one that would quench your thirst at least for a moment. And the note promises even more blessing than you need. But what if it is a hoax, or what if the pump is beyond priming, and the little jar of water would be wasted away into the sand? The faith of Job has to be poured out every day. You may have already given up your house, lost your job, your income, your belongings, your hobbies and toys, your friends and family, even your life ambitions, health and personal identity. There is still more in your heart that needs to be poured out…in faith. And then, the adventure begins. This entry was posted in A Life of Adventure, Faith, Living With Purpose and Passion and tagged Bruce Larson, Faith has to be poured out daily, Hebrews 11:1, Keith Miller, Prime the pump, The Edge of Adventure on February 28, 2013 by Bryan Thayer. The remark came from an older man who identified himself as “Whitey,” a nickname reflecting his full head of stark white hair. A group of us were helping clean out a house across the street from him, following the Cedar Rapids flood of 2008. Seeing Whitey working alone in his yard we walked over to help him and share our lunch with him. It was when we asked to pray with him that he made the comment about God “sleeping” when the flood waters devastated his neighborhood. This journey with Leukemia has included times when “the waters were rough,” and we know it will get rougher still. Like the disciples, it is clear to us that The Lord is still in the boat with us; He has not abandoned us. And also like them, we too have had moments of wondering how much He cares about the details of our situation. But just as He arose and calmed their storm, we know He calms us in the midst of our storm. This ‘knowing’ comes from faith and from seeing how God’s Word and His love guides us daily in very practical ways. Have you felt that God was sleeping while you or a loved one were struggling? Has His presence brought you peace? This entry was posted in Faith, Leukemia/Cancer and tagged does God care, Mark 4:38, Matthew 28:20, When God sleeps on February 27, 2013 by . There are some tests we can prepare for: high school quizzes, college entrance exams, work competency tests, even the test of marriage, or applying for a new job assignment. Each of these require preparation and examination of material that is somewhat unfamiliar and challenging to us. Some of these tests have to be repeated throughout life. This journey with Leukemia has tested me in ways I had not imagined and was not fully prepared. It has been amongst the hardest of any I have faced before. It has required examining my heart and the depths of my understanding. And the test is ongoing. But throughout each day’s test I have been strengthened by God’s grace and His immense mercy toward me. The comfort and truth of His Word have stood up to every daily test and have kept me from failing. Through this He has shown me once again that I really can believe His truths because they are most practical for daily living. Yes, I still struggle and wander throughout the day; I still get distracted. But God is always faithful to bring me back to center. 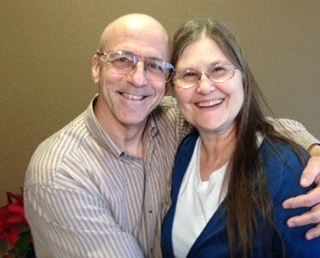 He has given me an amazing wife to walk with me and support me through the tests. And He has shown me that my tests are minor compared to others, which makes it easy to give thanks and to pray for those whose tests are very hard indeed. I hope that you find God’s presence and promise sufficient to sustain you through the tests you face. This entry was posted in Faith, Leukemia/Cancer and tagged Bone marrow aspiration, Passing life's tests, Testing for Leukemia on February 26, 2013 by . Who IS that (un)Masked Man? For the first time in three months my doctor says I can go without a mask. Which means that healthy visitors don’t have to wear a mask either. AND I can go out in public again as long as I’m careful about shaking hands, touching things, being around sick people, etc. While not a huge deal unto itself, it is what we say at work, “Take what you can get closest to what you want.” Complete change seldom happens overnight. You often have to go through a very long process to get what you are working toward. In the meantime, you celebrate smaller successive approximations of what you want. While my blood counts are still all below normal, we are celebrating and enjoying this small step…for another week or two when they will give me more chemo to knock the counts down again. What “little” things in life are YOU thankful for today? I hope your list is long! This entry was posted in Leukemia/Cancer and tagged 1 Thessalonians 5:18, give thanks, take what you can get closest to what you want on February 25, 2013 by . Well, for the first time since I started treatment for this Leukemia, my body sent false signals. I have been so tired I was sure my blood counts had dropped to the point I needed more blood. But a trip to the ER verified the counts were still slowly increasing. The nurse asked if I’d over exerted myself. And being sure that shoveling a little snow the day before had not been too much, I said “No.” Of course, Marcia had advised me not to shovel even the little walkway. But we had visitors coming and it didn’t seem to be that much work to shovel a couple inches of snow, even in my condition. After all, I was feeling pretty good and have been very careful not to do any work around the house. Do your days wear you down? Do your circumstances seem to overwhelm you? Are you daily reminded of your limitations? If so, be thankful. For you are now in a unique place where you can see beyond yourself and grasp that grace which is sufficient, that power which is available even in weakness. Embrace it… You won’t be wrong. This entry was posted in Faith, Leukemia/Cancer, Relationships and tagged 2 Corinthians 12:9, Beyond the limitations of Leukemia, Don Knight, I was wrong, strength in weakness, Three special words every wife longs to hear on February 24, 2013 by Bryan Thayer. I can tell I need a blood transfusion. The last two days have been increasingly tiring. I found out I can’t shovel even a little snow. A 90 minute midday nap didn’t restore my strength but it did do something. Let me see if I can show you. It would help to find a quiet place. Do you notice that in your quietness you can hear your heart beating? You don’t have to think about it or make it pump; it just keeps on beating exactly as it was designed to do, giving you life even when you are too busy to notice it. Be still. Do you notice that your body wills itself to breathe? Again, without any intervention or planning on your part, every breath brings you life. Breathe deeply and relax in the gift you are freely given. It’s harder to imagine this, but as you go about your normal routine, your bone marrow is making specific types of blood cells that function by created design. Some stand guard to fight infection. As you work, play, or sleep, red blood cells are being made by the millions to bring oxygen to your whole body. You wouldn’t be able to read this without them. Likewise, platelets also stand guard to repair any injury to your body. All this happens, seemingly without any effort on your part. In my quietness, I am thankful for the way God designed our bodies to function. All the years I donated blood, I never thought about being on the receiving end. I’m thankful for those who gave up twenty minutes of their day so I could receive blood and platelet transfusions, and live. In your stillness, what thanks come to your heart? People who care. The power of prayer. The promise of spring flowers. Safe drinkable water; a land free from war. A roof over your head, protection from the cold. Being loved; people TO love. A great and merciful God who loves you. This entry was posted in Faith, Leukemia/Cancer, Relationships and tagged Be still and find thanks, exodus 14:14, Psalm 46:10, Reasons to give thanks when you are too tired, The body as God created it on February 23, 2013 by . Cancer limits me but it doesn’t have to define my life. My desire to get through this is strong. But my desire for God’s will to be fulfilled in the midst of this and through this is stronger. I don’t want to miss what He wants to reveal. I wonder, what is defining your life? Is it the desire to be accepted by others? Or maybe the need to always have your way. Is it the desire to ‘get ahead’ in life? The pursuit of health and fitness or some new fad? Or maybe a sense of belonging to a worthwhile cause, to do ‘enough’ good things. Is it an uncomfortable position you find yourself in? Or maybe hopelessness has filled you with despair? Or Facebook? God has a marvelous plan for you. May your life be continually shaped and defined by His love and the hope He offers you. This entry was posted in Faith, Leukemia/Cancer and tagged Cancer limits me but doesn't have to define me, God's plan of hope for you, Is my desire for what I want stronger than my desire for God's will be be fulfilled?, Jeremiah 29:11, There's more than being a one year survivor, What is defining your life? on February 22, 2013 by . How uniquely made are we? Word from the University of Iowa transplant center today is that they have found four young guys in the world who might potentially be a close match for my bone marrow (stem cell) transplant. The next step is to confirm that they are still viable and available. If so, the transplant process could begin in four to six weeks. You are uniquely made and so am I. Someone else might look like you but no one else in history matches you exactly in how you are made up physically, emotionally and relationally. No one else has the exact same influence on others as you. You are not a mistake. Like a critical piece of a jigsaw puzzle, your life is intended for a purpose. And most likely that purpose involves others. No doubt you are already making a difference in others’ lives! Because of the way you love, the way you reach out to those who are struggling, the way you encourage others, the way you simply live life together with those who are alone…you are bringing light to the darkness. You can’t do everything. But you can do something. Donate blood to someone you don’t even know. Visit someone who is alone. Write an encouraging note to someone. Share a smile with someone who seems unlovable. Bring a meal to someone who can’t pay you back. Don’t insist that you have your own way with others. Stop getting upset at small things. Stop trying to be general manager of the universe. Don’t focus on your own problems. You are uniquely made. Live well today. This entry was posted in Faith, Leukemia/Cancer, Relationships and tagged Live well today, Make a difference by NOT doing something, Romans 12:13, Transplant match process, you are uniquely made, You can't do everything but you CAN do something! on February 20, 2013 by . Wife: Honey, watch out for the mailbox. Husband: Yes, I see it. Wife (as the car gets closer still to the mailbox): Watch out for the mailbox! Husband: I SEE the mailbox! Wife (as they get closer yet): you’re going to hit the mailbox! Husband: Don’t worry, I see the …. We can imagine and laugh at the conversation that might have followed. But we’ve all been there, right? We are certain that we have the perspective on something while the other person maintains THEY are the ones to ‘see clearly.’ How embarrassing it is when the ‘mailbox’ goes down because of US. Marcia and I have used this story when counseling young couples, reminding them that sometimes it is helpful to have a code phrase to bring clarity to a discussion. Whether in the home or at work, “I see the mailbox,” may be a good phrase to use to remind us that our vision, however clear it seems to us, may not be the only perspective on the situation. This entry was posted in Faith, Humor, Living With Purpose and Passion and tagged Ephesians 5:21, I see the mailbox, Perspective, Submit to one another on February 19, 2013 by Bryan Thayer. We said goodbye to our big cat, Ulysses, today. He had a history of health problems and passed away in his sleep last night. 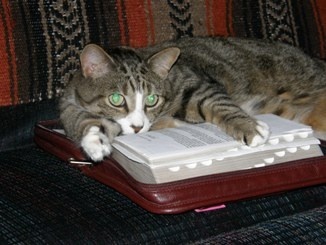 Here he is pictured a little younger (and smaller) as he cozied up to an open bible. I’ve come to appreciate the lessons that God teaches me through our pets. One lesson is quite obvious for a cat: don’t stress over the small stuff, maybe even the seemingly big stuff. If it isn’t chasing you it might not be that important. Another observation is how Ulysses, along with our other pets, didn’t appear to dwell on pain or discomfort. This, contrasted with us humans, who have quite an affinity for dwelling on every littlest suffering and telling everyone else about it. (“Can you believe I had to wait in line for twenty minutes, and then they closed the register, before I checked out? !”) I suppose we all have embarrassing ‘pity’ stories we wish we didn’t have! Everywhere we look, there is a reflection of His image. Even in us. What characteristics of God do others see in you? This entry was posted in Uncategorized on February 17, 2013 by .